We’re aware an internal document has been in circulation listing release dates for select Square Enix titles. This information contained in this document is inaccurate and features placeholder timing. Specifically – no announcement has been made to date for Kingdom Hearts III and Final Fantasy XV – their projected release window remains to be advised. Posted in Final Fantasy XV, Kingdom Hearts. I know I shouldn’t be excited. I know what square said bout the dates are placeholder timings. IF AT LEAST XV IS TO BE RELEASE IN 2014…. Then by Shiva, be excited PEOPLE! This could be a CLUE to something even bigger! New updates of trailers, announcement of special editions….. OR EVEN THE ACTUAL RELEASE DATE! I don’t think they will release FFXV this year, if that was the case we should have more info by now imo. If the game was going to release this year they would already be promoting it. We would actually know by now going by typical marketing schedules. I agree with you, they promoted Lightning Returns almost a year before the release date. I think they would start promoting FFXV at E3 2014 with a 2015 release date. I think the reasons why they showed a new trailer last year because the introduction of the next-gen, and it took 2 years without sharing any new information. Good. More time for development hopefully translates to XV being the next FF VII. I would hope for early Q2 2015 for Japan, maybe sometime late in April or so. This isn’t too surprising. Any list that had KHIII slated for release this year was a list without reliable information. 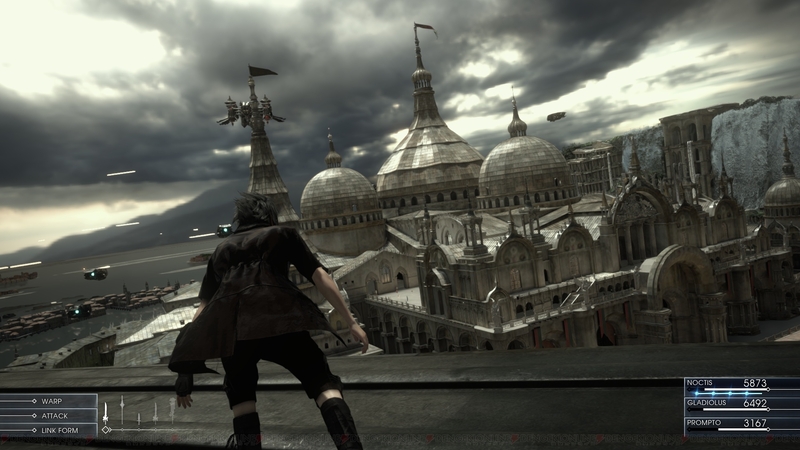 We’ll probably see Final Fantasy XV sometime in 20XV (HA. ), and I desperately hope it’s early in the year. Hope, but I know better than to expect. Fingers crossed that they’re still shooting for a simultaneous release. If Jay Preston isn’t a vicious liar, they may well still be, but again I know better than to expect. This was back when they claimed the game was exclusive to the Playstation after all. I actually had a question. Is there going to be a Japanese PS4 launch event as in other territories? I ask because Sony delayed the PS4 due to a lack of Japanese-oriented titles and the Xbox will likely do so poorly in Japan as to not be a factor. I’m curious if there will be any sort of event where XV might make an appearance. We might get three seconds of new footage. I hope we’ll get more information on XV after FFX/X-2 HD and LRFFXIII hits the western market. At first I was extremely excited when I saw the title for this update but when I read to the end I took a malboros breath to the face. Anything is possible. Its been a long time since we had a proper update of XV. I wish that Disqus had some sort of moderation abilities to allow the moderators of the comments to blacklist users like this, perhaps they do, I’m not familiar with it, but I noticed it as well and was confused. What’s even the point of downvoting all of the comments? It’s not like it does anything… lol. I bet the guy that downvoted must feel pretty proud of himself. This was the first I heard of this, it’s not very surprising to see that the games have this template release date of 2014 considering most retail sites will say the same thing. The more interesting thing is that this was “leaked” if you will at this time, what is the point of releasing information about these particular games? There are various other games that SE is working on that aren’t shown here, so it just seems confusing. Anyways, I’d like to see an event of some sort, or perhaps an announcement of information about XV when the PS4 launches in Japan, I feel like it’d be a good opportunity to show the Japanese public what games they can expect for the PS4. There is a crazy downvoter in every post and it’s pretty funny. Next time, wear a Ribbon. Read the title: Yeah!!! they cancelled the rumors of a 2016 release date, best news ever! While reading the article: Wait, WHAAT?! there was a rumor about a 2014 release date??? There’s slim chance for xv to release in late 2014, but yeah, won’t hold my breath. there is no way this game is coming this year.Nomura may have finished,perhaps,the script and plot of the game…but the gameplay part is still like a baby,in it’s first little steps,most likely. About XV,it is indeed conceivable the idea…but everything depends on E3 2014 on june.If they don’t announce the date there,then it perhaps will only be released by 2015 or 2016(10 years after the game was first shown,lol). Well,I was thinking about the promotion part…but the game is already flippin 8 years old.Most of the potential buyers are already aware of the game.SE perhaps only needs to release 2 or 3 more trailers. it depends:The game is already 8 years old.Most of the potential buyers are likely to be already aware of it. well,one can say that the silence is appreciated,since we won’t be getting spoilers.After waiting 8 years for the game,it would be bad if they released too much and ended up spoiling everything like with LR. Well,LR had that outburst of information to convince those who were thinking on abandoning ship to return to the last game of the trilogy. XV was hyped for 8 years…and just a tiny bit of information is already enough to make on a frenzy.But yeah,2015 is the most likely year. That picture above isn’t from any of the trailers we saw. No everything depends on TGS 2014 on September.If they don’t announce the date there,then it perhaps will only be released by 2015, If TGS 2014 Went and Gone no December 2014 for Japan then 2015.
well,they did reveal the game again on E3 2013,so that was a kind hint E3 is more appreciated by SE. But yeah,SE could pull something like releasing a bunch of info on E3…and withhold the release date info till TGS.But man…September,quite a wait…but yeah,if I was SE I would do it. I guessed who Lumina was and who the final boss was thanks mainly to the trailers and pics…that sure wasn’t pretty.But there was a compensation:The suspense of the reveals was partially substituted by the joy of having guessed right,after months of eager speculation. well,I am sure it would be safer to assume such a thing could happen after the PS4’s Japanese release.Maybe a blast of sells could be the green light square enix is waiting for to lift the dam on the information. just saw through the e3 trailer now. nova crystallis, what sorcery are you making. I’m sorry, but to anyone who seriously thought KH3 was coming out this year I feel kinda bad for you that you got your hopes up like that..
Now, XV it could be plausible that they’re looking for a end of 2014-beginning of 2015 release. However like many people here said, that is super-duper unlikely cause they’d already be doing press and whatnot on it. So my money is on a late 2015 release for XV and a who-the-hell-knows-when for KH3. Final Fantasy XV for PC port please…?!! Not a chance it was coming out this year anyway. If it was the promotion machine would already be in high gear. the game is 8 years old.almost everyone who could possibly buy this is already interested.They just need to release a trailer or two and the whole internet will be on a frenzy. I would think FFXV comes out in its first territory between November 2014 and March 2015 (hopefully in that frame, and hopefully worldwide, and hopefully in the sooner half). I wouldn’t expect KHIII until some point in 2016, possibly very late 2015,but I feel like work on it has only really just begun. I don’t know if this is the right place to ask about this, but, does anyone have any information about Noctis mom? I’m pretty sure that FFXV will have a release date revealed either E3 2014 or TGS 2014. That being said, I also believe (more like a feeling with some supporting facts) that it will be released 4Q 2014 or Early 2015 in Japan and Early to mid 2015 for everyone else. I just feel that with all of the promoting that has been done with FFXV since it’s first announcement back in 2006 and all of the trailers and information that followed that it should be enough to revealing a release date will be coming soon. Plus, with the “promises” made at E3/TGS about new info coming and less being silent means that the next set of info is going to be very important (not like characters or more about the world, but more like again stated a release date and some other minor info- this is where the characters, story, and world might come into play). This is just my personal analysis of the current situation and the two other FFXV related articles (this one and the two before). I don’t think anything has been said about her actually. But I imagine she died by childbirth. Maybe her death has something to do with Noctis’ eyes? Yes I agree, with the facts that we already have like “FFXV is quite far in development” ( 70% or above done personally) and just recently at the PS4 event in Japan they asked us to “Wait a (little) longer). All points to them showing FFXV at E3 2014 or at the very least a very strong indication that it will be there.